Libby and Dan (along with Steph, Charlie and Ben) are having a wonderful time together opening presents on Christmas morning. Ben holds some mistletoe up so his mum and Dan have to smooch. Juxtaposing this, Sam strikes a lonely figure as she calls her mum and pretends that she's having Christmas lunch with Dan and a small group of friends. Tearing up, Sam ends the call before she gets too upset. Susan and Karl lovingly wish each other a Merry Christmas before Susan sends her husband off to fire up the BBQ. Didge is randomly helping Ty set the table, while Donna and Ringo pash on the couch. Donna heads off to have lunch with the Robinsons and invites her bf along - as long as he wears the new shirt she got him. Ahh, I get why Didge is there: to ask Rachel whether or not she's told Ty about Hamish's contract. The answer is of course, no. Elle and Lucas giggle their way downstairs, freezing when they're sprung by Sam. Donna bursts through the door and gives Elle and Lucas Christmas hugs, but Lucas winces. LUCAS: I think I've thrown my back out. DONNA: Have you been lifting heavy objects again? Donna eventually clues into the fact that Lucas and Elle have TITTNL™ and is mucho excited. Elle invites Sam and Lucas to Christmas lunch at Lanzini's - Sam declines but Lucas happily accepts. There's minor concern when Sam clutches her stomach in pain, but she insists she's fine and that the baby's just kicking. Karl heads out to buy mince tarts and mineral water, followed by Didge, and then followed by Ringo in his new (pretty pink) shirt. RINGO: I'll see you guys later, Merry Christmas. SUSAN: You too. Now don't forget what I said if Paul asks you to pay. RINGO: Tell him to stick it. She goes to get dressed and Ty gives Rachel her Christmas present - a silver necklace with fancy dangly bits on it. That better be a Yuri Fujiyama original, Ty. Getting the guilts, Rachel tells Ty about Hamish's offer. Ty's crestfallen, but pretends he's cool with just being the songwriter. Lucas helps Elle out at the store and they make goo-goo eyes at one another. 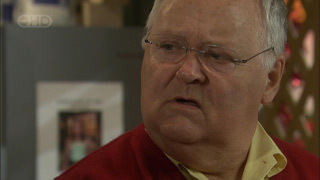 Harold meets up with Steph, but is soon bombarded with Ramsay Street-ers inviting him to various Christmas festivities. Karl wants him to have lunch at #28, Didge invites him to #26 for dessert and Toadie and Callum invite he and Steph around for some Christmas nachos. Poor Harold is very overwhelmed, which isn't unnoticed by Steph. Ben screams inside after playing on his new skateboard and Ty announces to the group about Rachel's contract. Everyone's excited for her, but Rachel isn't so enthused. KARL: Obviously my interest in music has had an impact! Hanging up from a phone call, Dan tells Libby that Sam isn't well and sounds scared. Karl offers to come with him to check on her, as does Libby, leaving Susan to look on in concern. Dan and Libby stand back while Karl finishes taking Sam's BP. Sam wonders if she could have pre-eclampsia. Karl admits her BP's a little bit low, but there's nothing to be concerned about right now. He tells her to call him if anything else happens, and Dan sees him out. Libby tries to make small talk but Sam scowls and demands to know why she's here. SAM: I told Dan to tell you, I don't want you anywhere near me. Harold brings over choccies for Susan and a seed bell for Dahl. Obviously Audrey, Chop, Lennie and that turtle with the long name were on Santa's naughty list. On the couch, Libby snappishly asks Dan why he didn't tell her about Sam's request, but doesn't stick around long enough to hear him out. Rachel's astounded that Hamish sent over a contract on Christmas Day, but Ty tells her to chill - she's made for singing. Cut to later and everyone has finished their big lunch. Harold starts to clear away dishes but Susan and Karl stop him - that's what they've got kids for. Susan casually asks Lib where Dan is, but Libby neither knows or cares at the moment. Harold tells Steph they'd better make tracks if they're going to make it to the Parkers. Whispering in a corner, Susan points out to Karl how moody Libby is after seeing Sam. Susan's furious, but Karl warns her not to interfere. Yeah, like that's going to happen. Everyone digs into their pudding and Steph notices that Harold isn't looking too well. Didge feels blah as well - she used to like pudding but now it churns her poor pregnant tummy. She races off to the bathroom with Steve following her. Steph gently reminds Harold he doesn't have to eat anything, but he takes a mouthful and insists he's OK.
Harold stares glassy-eyed at a humungous mound of nachos in the centre of the table, decked out in Christmas colours (white sour cream, red salsa and green guacamole). CALLUM: We've called it ‘Mt Nachosaurus'. Steph takes a call from Elle, who tells them they're ready to unveil the new store sign. She's prepared to tell Elle to wait since they're in the middle of eating, but Harold is getting fed up of people making decisions for him and snaps at her. Toadie looks worried. The window is wrapped up like a giant present and has a gift tag attached that says ‘Harold'. Everyone contracted for the ep mills around outside, having nothing else better to do on Christmas Day. Elle invites Lou and Harold (who is looking tired and unwell) forward and Lou makes a speech. LOU: Today we honour one of the best loved members of our community, and the very best friend I've ever had in the world, Harold Bishop. The General Store rose from the ashes of Lassiter's and it's been a big part of Harold's life, and mine too for that matter for many years. A lot of you come for a chit chat and have a few words of wisdom and counselling from a warm, dear-hearted person. (He chokes up) Harold, it's been great working with you, mate. And it's also been an honour being your friend all these years. No one deserves a more fitting tribute than you in our community so here it is. Lucas and Elle take the wrapping off to unveil the sign - it's exactly the same as the old one except it now says ‘Harold's Store'. Everyone claps and cheers but Steph can see that Harold isn't looking like himself. HAROLD: (downcast) Thank you for your kind thoughts. Although I believe it's customary to wait till after someone's dead before you start handing out eulogies and memorials and so forth. I wonder if you'd afford me the same courtesy. He walks inside the store leaving everyone stunned. Didge rushes in after him. Harold gruffly tells Didge he needs some time out and doesn't want any more sympathy, but Didge retorts that she's not here to placate him. She tells him straight up that everyone out there is his family and they only want the best for him. DIDGE: They just wish you could be here forever. You can't blame them for that. The Parkers are playing cricket with Callum and Ben, and Steve jokingly teases Didge about Christmas pudding to put her off her game. She complains to the umpire - who turns out to be Harold, back to his old jovial self. Rachel pops over with the contract and lets Ty know that there's no mention of his songs in there. Ty thinks it's just a mistake, and tells Rachel not to freak out, but Rachel snaps at him for patronising her. RACHEL: Oh come on, Ty, they don't want a singer they want a puppet. I didn't even open my mouth to sing yesterday and now this Hamish guy wants to give me a contract! What does that tell you? Why do they want me? Because he thinks I have nice hair or something? RACHEL No, do not try to pacify me, OK. This is not what I want, it's what you want. TY: Don't turn your back on it. RACHEL: Why because this is your big chance? She rips the contract in half and storms out. Susan stops by to give Sam a friendly warning about leaving Libby and Dan alone. She reminds Sam that Dan's moved on and she needs to accept that fact. SAM: And you think he can move on from being a father? SUSAN: Oh stop using that as an excuse. I've known someone like you, Sam, I know the harm you can do. SAM: And I see where Libby gets her holier than thou attitude. SUSAN: Libby deserves to be happy. SAM: Oh I'm sure she'll get what she deserves. SUSAN: I'll be watching you. SAM: Never threaten a lawyer, Susan, it's really not wise.